Yet again, Mumbai Indians have begun a season poorly. The ghosts of a pasting from Delhi Capitals in their season opener seemed to have vanished when they restricted Royal Challengers Bangalore in the next game, but an . It seemingly took away the confidence from their bowlers too - two nights later, all their main performers from the win were blunted by Kings XI Punjab. Mumbai are among the worst bowling teams in the tournament right now, and despite having a relatively constant core in place are getting caught off-guard in various situations. Chennai Super Kings is the only other franchise that also relies on a stable line-up, and despite the appearance of being the weaker team, man-to-man, in this fixture, have managed to make it work much better than Mumbai so far. Three wins in three matches, based largely on using the right resources at the right time - and a little bit of - makes them favourites against Rohit Sharma's team. Jason Behrendorff has joined Mumbai Indians after completing national duties for Australia in their recently concluded ODI series against Pakistan. He was seen batting in the nets on match eve. Evin Lewis' services in the Powerplay may be alluring, but Mumbai will stick to Quinton de Kock who has put up two consecutive 50-plus stands with Rohit Sharma. This shouldn't stop them from playing Ishan Kishan as a pure batsman in place of Yuvraj Singh, who has been striking at a significantly lower rate than every partner he's batted with so far. At 40.7%, no one in the IPL currently has a worse dot-ball percentage in the middle-overs than Yuvraj. Rajasthan Royals had only one left-hand batsman when they played against Super Kings on Sunday; this is likely why Mitchell Santner was brought into the XI in place of Harbhajan. Against Mumbai Indians and their various left-handers, Super Kings are likely to go straight back to the offspinner and to playing with only three overseas players. However, if they're worried about their batting, particularly the runs they're getting at the top of the order, Super Kings might be tempted to bring in either Sam Billings of Faf du Plessis to replace Ambati Rayudu, given they have Kedar Jadhav and Suresh Raina as bowling options. 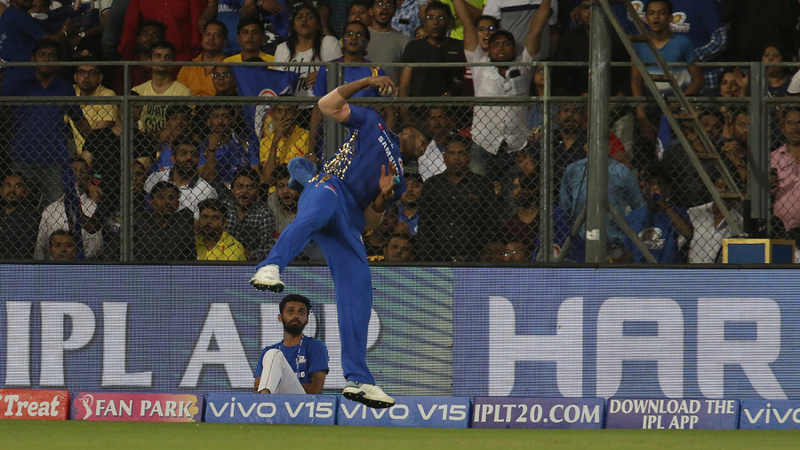 Mitchell McClenaghan has been a trusted wicket-taking option for Mumbai for many seasons, but if Jason Behrendorff is sans jetlag, he should be slotted straight in. Behrendorff's economy rate in T20 Powerplays is 6.2 and he averages 18.6, which is among the best ever. Mumbai Indians have failed to beat Super Kings in a season only once before - in 2014. Overall, they lead the head-to-head 13-11 and have won four of the last five fixtures between these teams. Suresh Raina strikes at more than 140 against any of Mumbai's likely bowling options on the night, with the exception of Malinga against whom he strikes at 127.8. Only Bumrah from Mumbai's entire roster has dismissed him more than once in T20s - twice in seven innings. An underrated feature of Super Kings' success so far is that in three consecutive matches, Deepak Chahar has bowled out his four overs up front. In none of those matches has he conceded more than five an over. Thirty-nine of his 72 balls this season have been dot balls, and he's currently conceding 4.66 per over.